It’s a little late in the year for this post, but I’m afraid I wasn’t writing yet when the sap started to flow in the birches. So I’m about to take you back in time. It’s easy to do, after all, since time, like words, exist in our imagination. 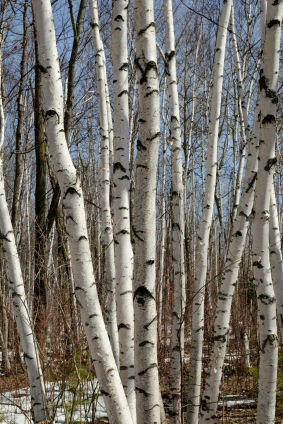 So imagine a grove of calm white birch trees: bright, open, and inviting. A friend of mine who grew up in East Germany during the cold war once told me that, in the Russian fairy tales she heard as a child, birch groves were always good and full of magic. She said the black spruce forests in these tales were the opposite: dark, foreboding, full of bad witches and danger. I can maybe see what those Russians were getting at, but still think the black spruces got an undeserved bad rap. Nonetheless, I’m right there with them when it comes to the birch groves — they are inviting places. In this magical grove, imagine the cold Alaskan earth waking from wintertime as the days grow longer and the sun shines warmer. Imagine the snow sinking down, getting wet and heavy, then melting away. And as the snow recedes through the grove, I’m ready. 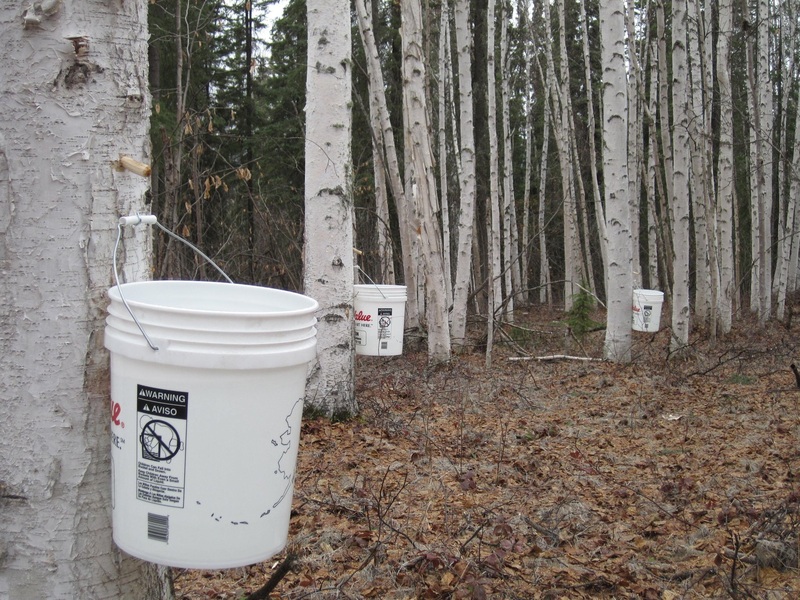 I’ve drilled tiny round holes in a number of the larger birches, placed taps, and hung buckets in anticipation. As the snow disappears beneath each tree, the taps start dripping. I’ve become the human equivalent of a tree-sucking mosquito. I’m asking the birches for a little of their blood. Thankfully, they have plenty and don’t seem to mind. The real mosquitoes won’t be out for awhile, and then only the big slow ones. Those gals are hardly worth worrying about. So the days are good for sitting among the trees in quiet contemplation. As the buckets start getting full, I lite a fire. 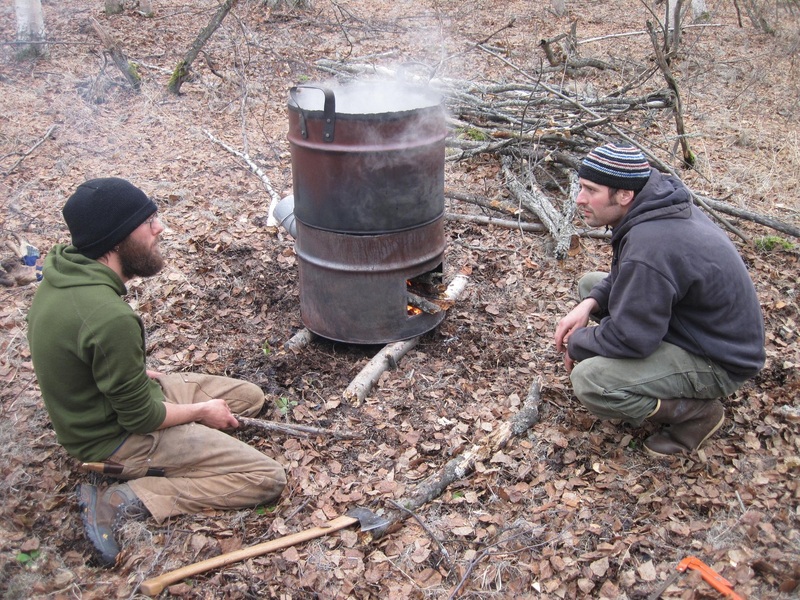 The previous week, my buddy David Jonas helped me make a sap boiler out of a 55 gallon drum, and now it’s time to test it out. Conveniently, there’s plenty of dead willow in the lower canopy of this forest, and a small spruce grove on the north edge, so we have no problem finding wood. In fact, even as I stoked the fire to a roaring blaze, ten hours a day for nine days, I wouldn’t have to walk more than 100 yards for firewood. Most of the folks I talked to beforehand said making birch syrup was “a lot of work”, but for the most part, I didn’t notice. Like Bob Black, I tend to view work as “forced labor”. Maybe sometime between day seven and day nine the days started to feel a little like work — mostly because I had taken on a task alone which would have been better served by two. But really, there was no “forcing” going on. Mostly the days involved gathering and sawing wood, stoking a raging fire (what red-blooded boy doesn’t enjoy playing with fire? ), drinking copious amounts of slightly sweet sap, and sitting quietly with the trees. (Though I have to admit, I listened to a little NPR and AM radio as well.) Mostly, what I did during those days felt like play. Just productive play. “Work” would be far too strong a word. And since what I was doing is rare these days, it wasn’t hard to encourage friends to visit. I was there all day, every day, which made me easy to find — nobody had to ask to be “penciled in” — my day-planner was clear. Quite a few hours were spent chatting by the fire. 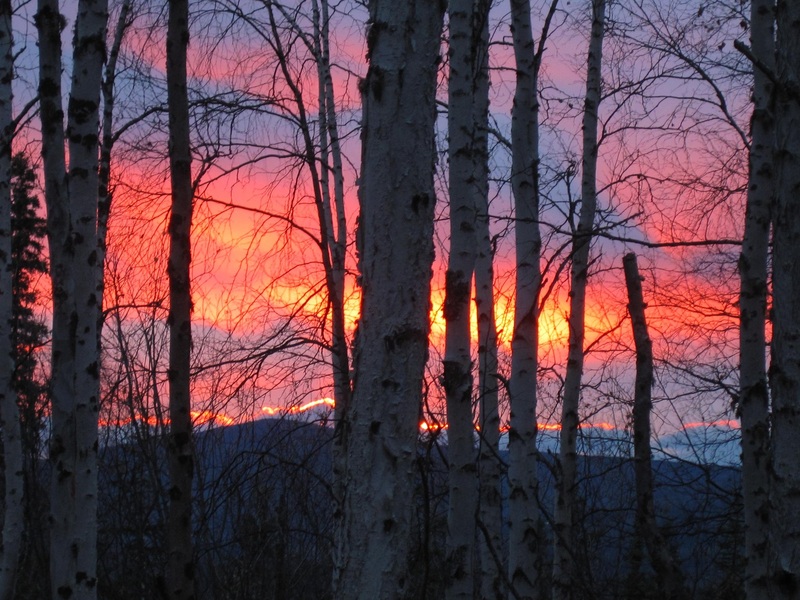 Each day I stayed until the sun started to set, enjoyed the purples and reds for awhile, then put out the fire and went back to my cabin. On day six, right before dusk, a goshawk visited. He seemed to be hunting, maybe for grouse. By the ninth day, when the sap finally started to run yeasty, I had boiled down some 300 gallons of sap into at least 12 quarts of syrup. Plenty to satisfy a modern primitivist’s sugar addiction, and still leave a good bit for sharing. And the best part was, I got to know some very nice trees along the way. What Antarctica says about Star Trek. Beautiful writing and pictures, brother. And I really dig the quote from Martin Luther. I’m really enjoying your blog. Thanks for sharing!! Beautiful! The writing is really amazing.